Qatar Hotels International Company (QHIC), owner of the Aladdin's Antics theme parks, announced today that it had reached a deal to take control of The United States of America for 31.33290 trillion rials in cash. QHIC, controlled by the government of Qatar in collaboration with the local and foreign private sector, has agreed to pay the equivalent of 31.33290 trillion rials, or 8.6 trillion dollars, for the USA, whose best-known tourist attractions are the Statue of Liberty and Las Vegas. "This deal is a key strategic move for QHIC," QHIC's chief executive Jurgen Braumhoff said. "It not only expands our business demographically, but also underlines our objective to focus on accelerating our expansion plans to include all of North America." U.S. Treasury Secretary Henry M. Paulson said in a speech to the Meeting of the G7 Finance Ministers and Central Bank Governors that this is a very "good deal," as our nation's explosive debt accumulation of almost 9 trillion dollars meant, "we would have been unable to continue to finance government operations." 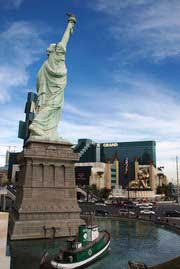 QHIC will have a 49 percent stake in the USA, which would become the world's largest visitor attraction group. America includes popular sites like the Holiday World Theme Park, Splashin' Safari Water Park, and New York City, as well as unusual rock formations all across the west. QHIC operates more than 50 attractions across 12 countries, including Kazakhstan's biggest theme park, Dungeon Playland.